Acrylic polymers are noted for transparency, resistance to breakage and elasticity. Spetec AG200 is a three-component, water-swelling hydrogel based on acrylic that hardens into an elastic product. It's a great choice for fixing leaking cracks and joints in walls. This product is also used in curtain wall grouting applications for soil stabilization. The main benefit of Spetec AG200 acrylic is its very low viscosity. The viscosity of water is 1.002 centipoise (cps), which is very thin. 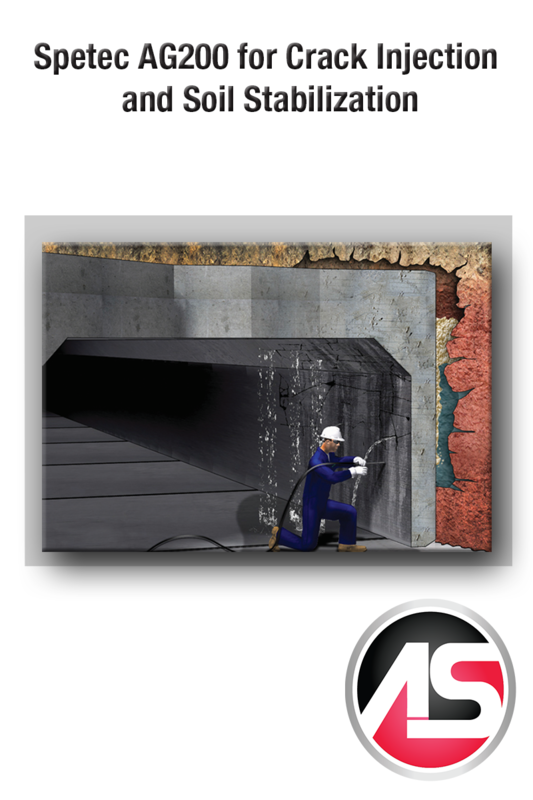 Spetec AG200 is 4.2 cps which allows this product to penetrate deep into concrete cracks, and also permeate soil very thoroughly. Another benefit is the product's tenacious bond to concrete. Flexibility in set up time is another key feature. Spetec AG200 can be made to set up anywhere in the range between 15 seconds to 60 minutes. With the fast set time option, you will be able to shut down very active leaks quick. With the slow set up time option, you will be able to permeate soil very effectively before the material sets up. Want more information on Alchemy-Spetec soil stabilization products?